After coming through three rounds of qualifying last week, Genie Bouchard kept up her winning ways to reach the second round at Wimbledon with a 6-0, 4-6, 6-3 win over British wild card Gabriella Taylor. The 24-year-old came out firing in the first set, playing with both power and control to push her opponent back and blast winners into the open court. The bagel set took just 20 minutes to complete. Bouchard continued to press hard in the second set, but Taylor, who was playing in her first-ever Wimbledon main draw, found some inspired form in front of a packed Court 14 crowd and managed to draw the match level at a set apiece. In the third set, Bouchard pushed ahead early, but both players maintained an impressive level of hitting throughout. Trailing the Montreal-native 1-4, Taylor managed to recover from 0-40 to get a hold of serve, but Bouchard’s grip on the match never loosened, as she eventually closed out the match with an explosive forehand winner. Despite a minor wobble in the second set, Genie Bouchard rebounded brilliantly and played some excellent tennis to win 6-0, 4-6, 6-3 over Gabriella Taylor. The 2014 #Wimbledon finalist is into the second round. Next up: No. 17 seed Ash Barty. The win on Tuesday marks the first time the Canadian has won four consecutive matches since early 2016, and could possibly signal a return to the form that in the past has seen her contend for some of the biggest championships in tennis. Up next for Bouchard on Thursday is No.17 seed Ashleigh Barty. Barty has put together an exceptional grass-court season so far, winning the title in Nottingham and reaching the quarterfinals in Eastbourne last week. 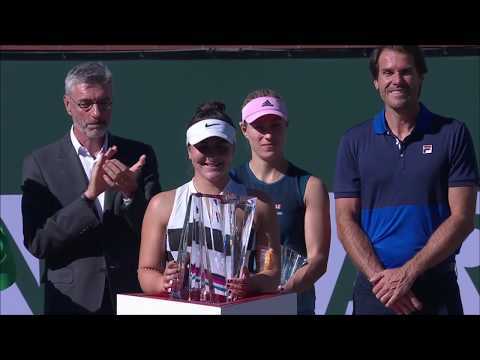 Both she and Bouchard are former junior Wimbledon champions, with Barty winning the girls’ singles title in 2011 and Bouchard claiming it a year later in 2012.